Many of you may not know who Peter Martyr Vermigli was. I didn't until I heard Derek Thomas talk about how hard it is to read his writings without taking out a second mortgage. That is a shame, because this thoroughly orthodox Italian Reformer was a contemporary of Calvin (ten years older, actually), and Calvin quote him quite heavily throughout the Institutes. His book Loci Communes is half the reason why I'm in the process of trying to learn Ecclesiastical Latin. Among the more interesting things I discovered about Peter Martyr is that he and Calvin both affirmed the doctrine of the duplex gratia deus - the twofold gift of justification and sanctification at conversion, by virtue of one's union with Christ. In his book The Zurich Connection & Tudor Political Theology, Torrance Kirby translates some selections from Vermigli's lectures on the book of Judges, given in Strausburg during the 1550s. These lectures relate directly to Vermigli's views of church and state. While these lectures were very relevant for their own day, addressing a monarchical political system, many of his themes are very interesting, and I will share some exerpts from Kirby's translation from the Latin. Both ministers and magistrates act to nurture the pious, but in different ways. The magistrate increases them in works, honours and merits. The minister consoles them through the promises of God and the sacraments. The magistrate assures that the laws are kept most carefully, the guilty are punished, and the good are both helped and nurtured. The law acts as a mute magistrate, while the magistrate represents the moving and speaking law. Certainly he is also a minister of God since, as Paul said, magistrates sing the praises of those who live justly. The magistrate wields the sword against the wicked, acting as the avenger and champion of God, and looks to nothing else but the salvation of men. For Vermigli, the civil magistrate and the church both have a similar goal/purpose. Both are concerned with mens' souls. "These two powers are in a certain way interchangeable, and deal with the same issues in various ways, and mutually reinforce each other." The magistrate is the outward spur as it were to good works, and the church is the spiritual or internal spur. I find the reference to the law as a 'mute magistrate' to be very profound, as well. Just as we make daily use of the sun and the moon so is it permitted to employ the services of the public magistrate, of whatever sort he may be. The word of God supports all ecclesiastical power, so it is nothing without it. Moreover, the word of God is a common rule by which everything should be arranged and which everyone should obey. It teaches how the external sword and the commonwealth should be managed. It shows us how all things should be done by all men. In this way, the ecclesiastical power encompasses everything, because it draws its propositions from the word of God. There is nothing in this world to which the word of God fails to extend. Those who seek to know what churchmen have to do with the commonwealth, with warfare, pharmacy, or cooking falter seriously. They say that when a minister of the word takes notice of these things, he violates the law of God, and should be reprimanded according to the word. Why not warn them? Why not command them to stop their sinning? The minister’s duty is to correct sinners, not with the sword or through fines, not through prison sentences or exile, but rather by his own proper function, which is through power of the word of God. Political power extends to all things that pertain to political power, yet in what way? Does the civil power command the appropriate motions of the soul and of inward repentance? It cannot bring about these things. Instead, it provides the individual with the means to bring these things about on his own...The proper methods of ruling for both powers must be taken from the word of God, which is in the Church. He is ordained as the guardian not only of the first table of the law, but also of the second. He who offends according to either table attacks the regal power. While a king can remove useless or harmful bishops, a bishop cannot cast down a king who has sinned. John [the Baptist] criticises Herod, but does not reject him as king. 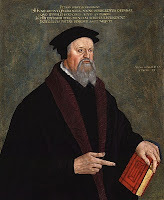 I'm sure that there are others better equipped to evaluate Peter Martyr Vermigli's political views, but you don't exactly run into Vermigli translations every day, so I thought I would share the more interesting nuggets from what I've read. Needless to say, however, Vermigli probably wouldn't be best friends with Paul Helm or D.G. Hart when it comes to political matters.